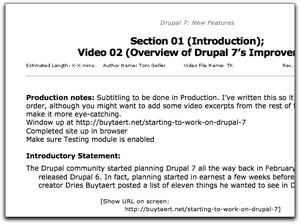 I forgot to mention in my post about the “Drupal 7 New Features” video series: You can check it out for free with this free 24-hour pass to lynda.com.. Enjoy! Is it the graphic, or the whole post? Hi, Dylan. Do you think the whole post is out of place, or just the graphic? I think the text itself is fine. It’s true that without the graphic, I wouldn’t have had the same feeling about the post. 300×250 is a standard ad banner size, and combined with “24 hour free pass” in large type it really stands out. No site launches without some sort of narrative, case study or other aspect from which people might learn something. So I think if the graphic had been included in your previous post, which did contain a narrative, that would also be fine. Just FYI if you update your post without altering the created date the original post on the Drupal Planet will get updated without being pushed to the top. Not that you should do that with this post, I just want to clarify. Thanks for the guidance, Wim. I’ve replaced the graphic. Thanks for this great course about Drupal 7 new features. But as I’m starting to build new site for a client, Should I build it on Drupal 7 beta or stay with 6 till 7 final will released? It really does have quite a few advantages over Drupal 6. Drupal 6 has a shorter lifespan. When Drupal 8 comes out (whenever that is), official support for Drupal 6 will stop. When that happens, you’ll have to migrate to Drupal 7 anyway. You’ll have trouble doing that if you start using any Drupal 6 modules that don’t get an upgrade to Drupal 7. The D7CX movement is making Drupal 7 very well supported from Day 1. So you’ll have a lot of contributed modules at hand right away. The only reason I can think of starting with Drupal 6 is if there’s a module you *must* have that isn’t available for Drupal 7. Other suggestions for course material: jquery and drupal… and the various installation profiles, e.g. Tattler. I was wondering if you were going to do a more extensive title on Drupal 7? At first, I actually assumed that this would be the natural progression. Often training courses, will have an overview, new features, preview, type course when a new version of a software packages comes out. Many of the Adobe titles are like that. So, it’s hard to tell at this point, for me, if it is necessary or whatever to have a Drupal 7 Essential training course. Maybe there are enough new ways of thinking, designing and developing sites that come with moving to drupal 7 that it warrants a full 5.5 to 7 hour training course, like your D6 Essential Training course. Eventually, folks may come straight to drupal 7 without using Drupal 6. In that case, a Drupal 6 EST course is not so needed by them. Oh, and the Drupalize.me site gives a new features tour of D7 – don’t worry, I won’t leave your courses because I have a membership on Drupalize.me… They touch on one of my favorite topics and features (as in features for web technology or websites in general) and that is rdf. They just spend about 3 minutes talking about it though. I hope this is the best place on your blog to post this to get lots of attention. For what it is worth, I would like to see the following topics on lynda.com: (1)Drupal 7 theme creations/design/etc. (note: I just started your Theme Gardens course, so I don’t know if with the free version one can download the theme one created there and use at any drupal self-hosted, elsewhere hosted site and if that course would help one to learn theming or if theme gardens makes it unnecessary)(there is a D6 Theming course on Lynda.com that I didn’t complete yet and I don’t know how applicable that would be to D7). (2) A full-length 6 hour or so D7 EST course (3) Semantic technologies and Drupal (D7), such as rdf, rdfa, evoc (sp? ), OpenCalais, and other associated extensions or aspects of drupal 7 core. As an aside note, which hopefully isn’t off topic, have you used Mediawiki much? They have a Semantic MediaWiki Bundle. It might be interesting to mash-up Drupal and Mediawiki. I don’t think Lynda.com has any titles that deal with mashups – much less a drupal and some other powerful web application – there’s mediawiki, the next generation, genealogy software and another example wordpress – but that may not be needed as drupal has blogging. Anyway, I need to figure out how to get emails when my posts have replies. Please let me know. Also, do you have more than one feed here? Bruce – former Joomla user now I much prefer drupal. 1) Drupal 7 Essential Training is on its way! I recorded it in December and it’s in late post-production now. I can’t say when it’ll actually be released, but expect to see it very soon. It’ll be at least six hours. 2) You *can* build themes in Drupal Gardens, and those themes are 100% exportable and compatible with core Drupal. Now, you can only change the CSS: If you want to change theme logic, you’ll need to watch Chris Charlton’s “Drupal: Creating and Editing Custom Themes“.